Waves of nostalgia washed over the country on Tuesday night when BBC2 screened Get It On, the first of a fascinating four-part series looking at life in the 1970s. to describe the phenomenon of hysteria which engulfed fans of the clean-cut, all-American family. The youngest member of the Osmond clan was “little” Jimmy, who, in 1972, had a number-one hit in the UK with Long Haired Lover From Liverpool. The following year, The Osmonds had an incredible 13 records in the charts and overheated girls screamed loudly for their attention everywhere they appeared. 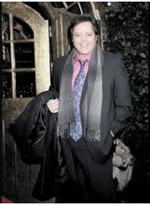 Those who missed out seeing them first time round have a chance to recapture their youth and perhaps scream a little when Wayne, Merrill, Jay and Jimmy Osmond play Aberdeen’s Music Hall on Monday night. Speaking about the early days, Jimmy said: “It was a lot of fun, and my memories from those days are amazing. “We were lucky to have performed with stars such as Elvis Presley, Frank Sinatra, Bob Hope, Lucille Ball, John Wayne, Jerry Lewis and Andy Williams. “I’m not trying to be a name dropper, but we really interacted with these wonderful people who gave us a break and helped us. “A lot of people think it was Andy Williams who first put us in the spotlight, because we were regular guests on his show, but it was Walt Disney who started the brothers. “My brothers were going out and entertaining people for a long time and I wanted to be part of that. It just seemed a perfectly normal way to live for me,” said Jimmy, who is married to Michelle and has four children. 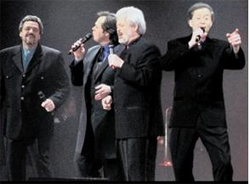 The show, Up Close and Personal – The Final Tour: The Osmonds, will take fans on a journey through the group’s many unforgettable hits, from classics such as One Bad Apple, Down By the Lazy River, Let Me In and Love Me For a Reason to Crazy Horses and Long Haired Lover From Liverpool. Happy memories is one of the reasons the four brothers are undertaking this tour. “My brother Merrill, who has always been the voice of the family and the lead singer on all those hit records from the 1970s, wants to try something different,” said Jimmy. “Everyone tries to support each other when they take a different direction, which I hate because, as the youngest in the family, you want to hold on to and have the love and support of your brothers all the time. “Merrill wants to do one last tour with us. “It’s all about remembering things and the people who helped us, but, more important, it’s about saying thank you to the fans – I prefer to call them friends – who have stuck with us for years and kept the fire burning in us.